If history is to be believed kites originated in Shandong, the easternmost province of China, more than 2000 years ago. Way back then they were used in various ways, from the ‘wooden black-eared kites’ that could hold the weight of a soldier for military surveillance purposes, to seventh-century Buddhist monks who used them to bless their harvests and distract evil spirits in the sky. There’s even a tale about a man who used a very large kite to get to the top of a castle, where he then stole a golden statue. How he got down, or whether the heist was successful we’ll never know, but it’s a good story. Fast forward a few centuries and we’re still fascinated with kites. In fact, all around the world countries hold national kite days celebrating the simple joy and splendor of this age old tradition. There’s even an old Chinese saying that goes something along the lines of: “Those who fly a kite can have a long life”. I can’t vouch for kites giving you a long life, but for an activity that is relatively inexpensive and accessible to everyone, it’s hugely beneficial, from an educational point of view, as well as on an emotional and physical level. 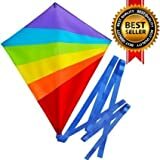 The brightly colored rainbow kite is made from non-toxic materials and is perfect for little ones. The long tangle-free tail keeps it stable and the kid-friendly handle makes it suitable for younger children to control. The kite takes off easily and flies in low winds, again making it the ideal kite for kids and first-time flyers. It comes with a lifetime warranty and a money back guarantee, making it one of the more popular selling kites. Is it a bird? Is it a plane? No! It’s a flying octopus. This is without a doubt one of the coolest kites around but I have to warn you, if you don’t like pulling crowds or being the center of attention, it’s best you avoid it. The octopus kite is perfect for all ages but it’s recommended an adult assists smaller children, otherwise there’s a chance you’ll have an airborne octopus and child on your hands. Believe it or not, even with the tentacles, this kite is tangle-free, the material is strong and durable and it comes with a lifetime guarantee. Send your creativity soaring with this Design Your Own Kite Kit. The kit comes with everything you need to design your very own one-of-a-kind kite including a 20-inch white kite with a tail and string. It makes for a great gift, encouraging creativity and outdoor time. The Arianna Mermaid Kite is incredibly easy to get off the ground, and with very little effort, it flies well. The kite is a simple design, which means it’s quick and easy to assemble. If you’re an experienced kite flyer then this isn’t the one for you but it’s perfect for your children or grandchildren. The manufacturer’s age recommendation is 10+ but younger children will definitely be able to fly it. At 12 inches this is one of the smaller kites available, which makes it ideal for little ones, even pre-schoolers. 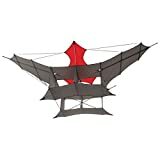 The ladybug kite is made of ripstop nylon with flexible fiberglass spars, making it almost indestructible. It’s incredibly easy to fly, looks pretty cool in the air and is the perfect party favor or gift. You know you’re looking at a quality product when it comes with a 1 year 100% money-back no questions asked guarantee. 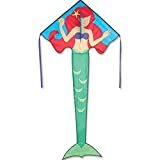 It includes a double tail, kite bag, 100 feet long kite line and handle, so all you really need to do is assemble it, and even that’s quick and easy. The design of the sunny diamond kite is basic (in a good way) and it takes off with very little effort. Because flying kites is meant for all ages I thought I’d include the Prism Nexus, a dual line stunt kite that will appeal to older kids and adults. It’s big enough to give you the experience of ‘extreme’ kiting, like the ‘pull’ and the loud roar, but it’s small enough to put in the car and take to the beach. It’s also really easy to take apart. For someone just getting into stunt kites this definitely one to have a look at. Remember the good old box kites? Like Elvis and blue jeans. some classics just never die. I remember my dad coming home with one of these and my absolute delight seeing it take off. At that moment my dad was my superhero and I was the happiest kid in the world. The box kite is quite big, like 20″x40″ big and has a wind range of about 7-20 mph, so it’s not ideal for younger children. However, more experienced flyers and superhero dads will love it. 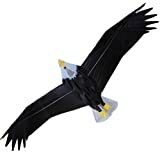 I was sold at 91/2 foot bald eagle kite! 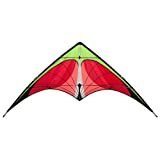 If you’re seriously into kites then you either have one of these, or have dreamed of owning one. This is the real McCoy of kites and is made to the same exacting standards of European master kite builder Lutz Treczoks. It doesn’t claim to be easy to assemble and you’ll need to know your ‘ground stake scheme’ when launching it (and if you know what that means, then this is the kite for you). When you fly a Treczoks Cody you’re not just flying a kite, you’re flying a piece of aviation history. Given how special this particular kite is I’d imagine it becoming something you pass down from generation to generation as well. This is an awesome dino’soar’ kite for young and old. The T-Rex offers the least amount of frustration in terms of assembly and flying and the most amount of fun. It’s even available in frustration-free packaging. 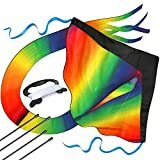 I’ve had two friends recommend this kite for children with special needs because of how easy it is to fly. It definitely lives up to its name. Whichever one you choose it doesn’t matter, what does is that you’re outside, enjoying the fresh air and the sheer joy that something as simple as a kite brings. Feature image courtesy of Flickr, dav.idbain.